Warm up with this Kale and Linguica Portuguese Soup! It’s packed with hearty kale, spicy Portuguese sausage, and a tomato broth that’s bound to keep you toasty all night long. Nothing comforts a cold day like a simmering pot of delicious stew. Even better when that stew is easy to put together and results in one of the most delicious soup recipes you’ve ever tasted. Seriously, jokes aside – this soup is amazing. It’s a rich tomato broth that mingles with cooked kale, carrots, onions, celery, and that delicious Portuguese sausage, Linguica. New England, specially Massachusetts, has a large population of Portuguese people, thus the love for Linguica. It’s a smoke cured pork sausage seasoned with garlic and paprika. It adds a fantastic punch of flavor, but if you can’t find linguica in your local markets, you can substitute for chorizo or any other seasoned pork sausage. But definitely do not skip it – unless, of course, you’re vegetarian. To make this Portuguese soup vegetarian is easy though: sauté your vegetables in extra virgin olive oil and use vegetable stock! 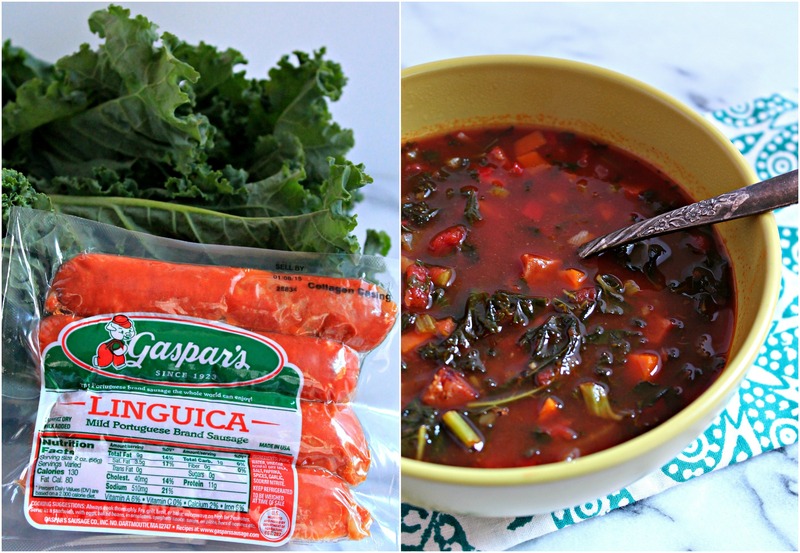 Kale and Linguica Portuguese Soup will become your favorite soup this season – let me know when you make it! This classic Portuguese soup has become a favorite of mine after tasting it in various local restaurants, where the Portuguese and Brazilian population is heavy. In a large stock pot, over medium high heat, sauté the sausage until seared. Add the carrots, celery, onions, and garlic. Saute until it is all transparent. Add the kale and can of tomatoes and stir until combined. Pour in the stock and let simmer for 30-45 minutes. Perfect soup to make a batch of and freeze the rest for nights when you don't want to cook! « Sabra, Cabot Cheese, Stonyfield, and Bob’s Red Mill Giveaway!